ProjectBridge recently organized a day of science education for the Baltimore community focusing on neuroscience – BrainFest. As a faculty member at Goucher College, a small liberal arts college, I love teaching STEM outreach and am always trying to fit opportunities into my schedule that will get children and teenagers excited about science. 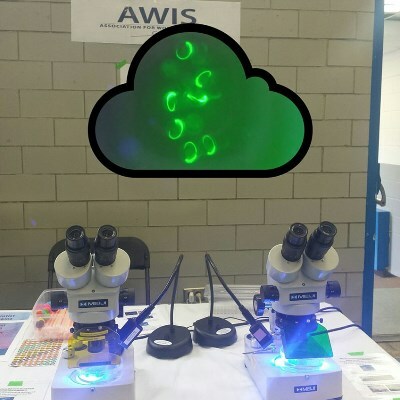 I was happy to volunteer with the Baltimore Chapter of the Association for Women in Science to bring a little of my research to kids in the community at BrainFest. I had a trick up my sleeve that is always popular: glowing baby fish. In my research, I study how the retina develops and regenerates in zebrafish, and one of the tools I use extensively is a fish in which the glial cells in the central nervous system express green fluorescent protein (GFP) (Tg(gfap:EGFP)mi2002 transgenic zebrafish line for anyone interested). I purchased a NIGHTSEA™ stereomicroscope fluorescence adaptor system when setting up my lab a few years ago, since it was an economical way, at a small college, to screen fish embryos for this GFP expression. I found that given the great expression levels in this fish, and the mobility of the NIGHTSEA™ adaptor system, not only has it been easy to screen fish in a room with the lights on, but I can take the show on the road to schools and science events, such as BrainFest. The children (and adult family members!!) 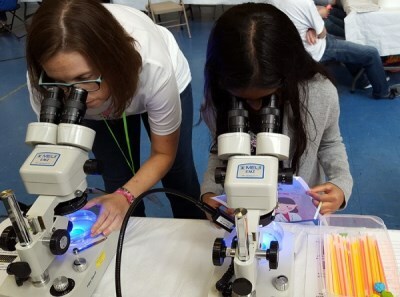 who looked through the microscopes at BrainFest were amazed that they could look at the nervous system of live embryos. 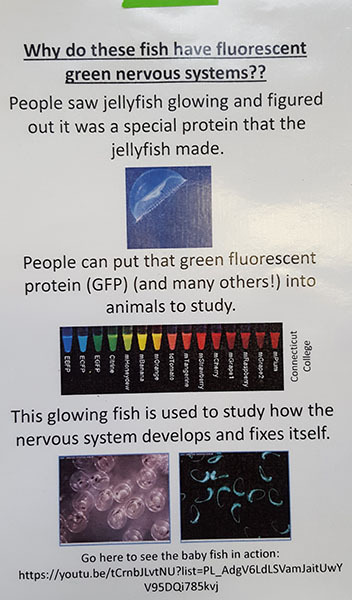 I also brought this glowing fish show to Baltimore area middle and high schools and talked about everything from what is GFP, to how can you use zebrafish to answer research questions. At Goucher College, the NIGHTSEA™ adaptors have worked great in independent student projects in college introductory biology, my upper-level course in developmental biology, and a colleague's advanced genetics course. Dr. Lenkowski has posted videos on YouTube showing fluorescent zebrafish at one and two days post fertilization.